Malibu Skipper dolls were sold for many years. These Skippers had straight, blonde hair (with one exception) and sun tanned skin. The vintage head mold was used for them, but they now had centered eyes. There were some issues that were only available in Europe and/or Canada. The first issue was called The Sun Set Malibu Skipper #1069 and was on the market from 1971 - 1974. She was dressed in an orange two-piece swimsuit and came with lavender sunglasses and a blue terrycloth towel. Some of these dolls were sold with wrist tags, some without. They were packaged in orange or pink blister cards. Sun Set Malibu Skipper was also released as a Japanese issue in 1972 (I think she might have been already sold in 1971) with the same stock number. She was packaged with the same blister card and with the same accessories as the doll above, with an extra sticker stating Sun Sun Skipper in Japanese. 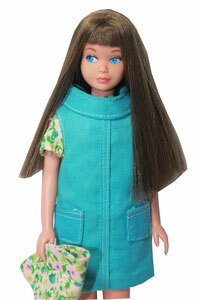 The doll was almost identical to the above version, except for her brown eyes, brunette hair, and rooted eyelashes. This Skipper doll is very rare. The second issue of The Sun Set Malibu Skipper was sold in 1975 with the same stock number like the first issue, but she came in a white box. There was an additional Korea marking at the waistline. The first Malibu Skippers produced in Korea had the same legs like the ones made in Japan. Later dolls made in Korea had shiny legs that looked skinnier. Gold Medal Skipper #7379 was sold in 1975 and 1976 with reference to the Olympic Games in Montreal. She was exactly the same doll as the #1069 Sun Set Malibu Skipper from 1975, but she was dressed in a red, white and blue bathing suit and came with a "gold medal". Unlike the other Malibu Skippers, which were sold on blister cards or in boxes with displays, she came in a rare white box without a display that showed a drawing of the doll. In 1978 the #1069 Malibu Skipper was sold in a pink box that was slightly smaller than the pink box before. The Skipper doll’s arms on the drawing had a different stance. This doll was fabricated in the Philippines. The Philippines dolls had smaller and harder heads than the dolls made in Japan or Korea. This doll is much rarer than the Malibu Skipper dolls of the previous years. Simultaneously, the remainders of the Malibu Skipper dolls produced in Korea were sold as a Baggie Malibu Skipper version. This version was packaged in transparent plastic bags available at Sears only. The accessories were the same as the ones of the dolls in boxes. In the U.S.A., some remainders of the #7379 Simpatia Skipper swimsuits were sold on the 1978 #1069 Malibu Skippers in the pink boxes made in Korea from the previous years. The boxes show the regular two piece orange swimsuit. Also in 1978, another version of this Malibu Skipper doll was available in Germany and France only. She was called Play With Skipper (Spiel Mit Skipper) #2167.